Gresley A3 class pacific 'Donovan' north of Peterborough at Lolham, heading a northbound K..
A Great Western Railway 0-4-2 tank locomotive No. 1420 with an Auto-Train beside the River Dart.The ..
St. Andrew's - Birmingham City's football ground with railway running behind the stadium.This 1964 s.. The Great Western Railway's Princetown line on Dartmoor in Devon. The branch train is seen in 1955 -..
Great Western Railway 0-4-2 tank No. 1420 crosses the river Dart just south of Buckfastleigh on the ..
An ex LMS Stanier 4-6-2 Princess Royal class No. 46208 'Princess Helena Victoria' passes Lichfield T..
Stanier pacific No. 46238 'City Of Carlisle' with the Night Mail in the early 1960's. She is se..
Freight train crosses the Crumlin Viaduct in 1960. The viaduct was located above the village and was..
King Edward VII bridge Newcastle. A Gresley A3 pacific crosses the River Tyne with an express train ..
Highley station on the Severn Valley Railway.Great Western Railway 0-4-2 tank loco leaves with a pus..
Castle class locomotive number 5069 'Isambard Kingdom Brunel' is seen heading west with an express f..
Stanier pacific No.46254 crests the summit of Beattock bank with a Glasgow bound express in the earl..
Stanier pacific No.46227 Duchess of Devonshire takes water from Dillicar water troughs as it heads a..
LNER Gresley A4 streamline pacific No. 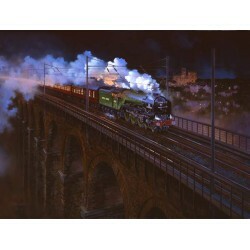 4498 'Sir Nigel Gresley' crosses the Border Viaduct at Berwic..
Gresley LNER A3 locomotive number 60078 'Night Hawk' on the East Coast mainline in the late 1950s. .. 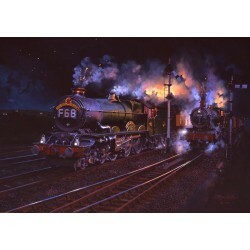 The Red Dragon - Paddington to Carmarthen express train is seen in the early 1960s headed by a Great.. The Waverley is seen near Ais Gill summit on the Settle Carlisle railway in 1963 haul by a Stanier '..
New-build Peppercorn A1 'Tornado' passes the city of Durham in 2010.Image: 415mm x 305mm • Over..